NATAL, Brazil, May 15 2014 (IPS) - Brazil’s efforts to promote the image of an environmentally sustainable World Cup have focused on the stadiums built for the tournament. But the 12 cities where the matches will be played are in a race against time to complete the urban transport projects. Natal, the capital of the state of Rio Grande do Norte in the Brazilian Northeast, is one of the cities that will host the World Cup 2014, and four games will be played here. This city of 800,000 people is known in this country as the “city of the sun” because there are more than 300 days of sunshine a year, enjoyed by visitors to the state’s 400 km of beaches. This is the city with the cleanest air in South America, according to a study carried out in 1994 by the National Institute for Space Research (INPE) in partnership with the United States National Aeronautics and Space Administration (NASA). Water quality here is also excellent, because the water is “filtered” by the vast dunes surrounding the city. Natal, which receives 1.5 million tourists a year, is now seeking an image of a sustainable city during the World Cup, which will take place in Brazil Jun. 12-Jul. 13. 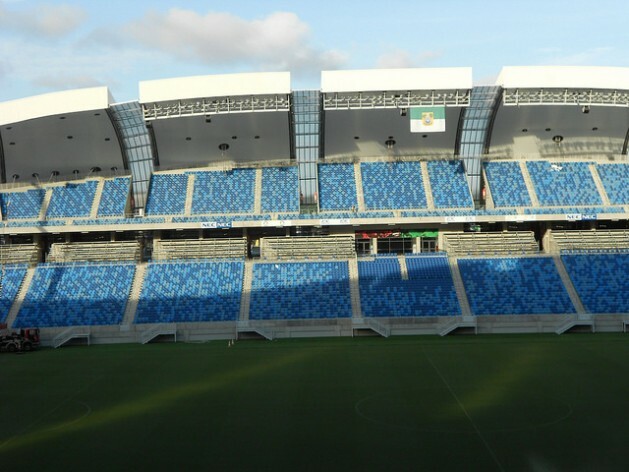 The Arena Dunas stadium in Natal was officially inaugurated on Jan. 22, with a capacity for 42,000 spectators. The cost went 30 percent over the 190 million dollar budget, but at least the project is considered environmentally sustainable. The OAS construction company, which built and is managing the stadium, will harvest rainwater, which will cut water consumption by 40 percent. And nearly 100 percent of the waste generated will be recycled. In contrast with how early the stadium was finished, the urban transport works in the city run the risk of not being completed by the World Cup kickoff match on Jun. 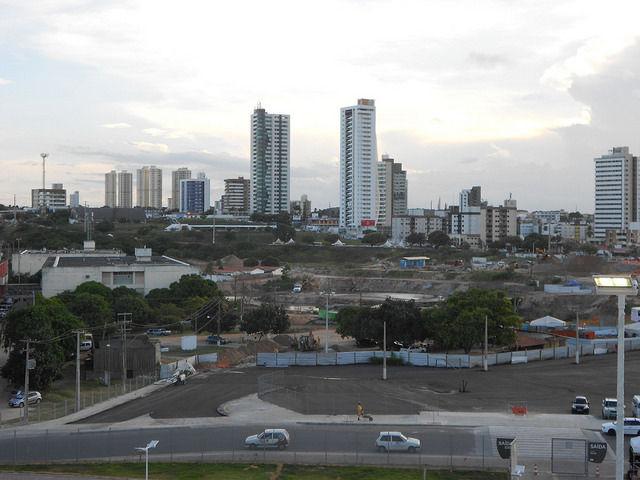 13 – which could hurt the image of Natal as a sustainable World Cup city. Of the seven transport projects planned, only one was completed, a year ago. At that time the remaining six were still only on paper, and three ended up being cancelled, after the city government admitted that it was unable to implement them. The mayor of Natal, Carlos Eduardo Alves of the opposition Democratic Labour Party (PDT), told IPS that the city would be ready to host the World Cup thanks to 250 million dollars in federal funds. “When Natal was chosen to be one of the host cities, it had 53 months to build the infrastructure and complete the projects. When I took office in January 2013, there were only 18 months to go, and nothing had started yet,” he said. A total of 1,450 people are employed in shifts, 24/7, on the infrastructure projects. In 2012, the people of Natal were taken by surprise by the announcement that on Capitão Mor Gouveias avenue, one of the city’s main arteries, the property of 3,000 residents and 200 business owners was to be expropriated to make way for the construction of a road from the new airport to the stadium. “One morning an official came to my business and handed me a letter informing me that half of the 200 square metres of my shop would be expropriated. He did so in a rude manner, and I was indignant. So we decided to fight the measure,” Jonas Valentim, 73, told IPS. He became one of the representatives in Natal of the “association of people affected by the World Cup works” (APAC), created in 2012 He is also a member of the World Cup People’s Committee, which has protested that the infrastructure works are not in line with the needs of the city. In the case of Capitão Mor Gouveia avenue, the local residents and business owners managed to avoid forced eviction by asking specialists at the regional university to help draw up an alternative project, since the authorities had not consulted experts. “We made suggestions to use avenues with less traffic, where no expropriations would be necessary,” said Valentim. That is the project currently being implemented – and no one has been evicted. Alves guaranteed that six tunnels and a viaduct would be finished by May 31. A second viaduct won’t be done on time, but it will nevertheless be open to traffic during the World Cup. He added that 4,000 trees would be planted around the city. He also said the big problem facing Brazilian cities today is traffic congestion, which is why tunnels and viaducts are being built, to ease traffic jams. But the coordinator of transport research in the Civil Energy Department of the Federal University of Rio Grande do Norte, Enilson Medeiros dos Santos, doubts that the six transport construction projects around the stadium will be finished in time for the tournament. Santos, a prominent voice in urban planning in Natal, complained that his team was not consulted when the transport plans were drawn up. Santos also complained about a lack of information. Of the cities that will host the World Cup games, Natal was ranked the lowest on transparency in investment in 2013 by the Ethos Institute. “No one has access to the executive projects, it’s all a total mystery,” he said. According to Santos, Natal was the fruit of an accelerated development process and is one of the cities in the Northeast with the highest number of motor vehicles per capita. The city has one motor vehicle for every four inhabitants, while demand for public transport is falling. There are more than 260,000 vehicles in the city, and since 2000 the number of cars has risen at a rate of 20,000 a year. “The city does not have chronic congestion, but traffic has gotten worse quickly in the last 10 years. We had already pointed out the problem in 1998, if the city failed to put in place high-quality public transport systems,” Santos said. In June 2012, during the United Nations Conference on Sustainable Development (Rio+20), FIFA, the international governing body of association football, announced that it would invest 20 million dollars to make the 2014 World Cup the first with a comprehensive sustainability strategy. The strategy included “green” stadiums, waste management, community support, reducing and offsetting carbon emissions, renewable energy, climate change and capacity development, according to FIFA and the Local Organising Committee. FIFA also stated that it would give priority to environmentally-friendly suppliers, and that it would carry out studies to assess the environmental impacts on the areas around the stadiums. In addition, the construction projects had to obtain environmental permits, as a condition for receiving financing from the country’s state-owned development bank, the BNDES. Another BNDES requisite was for the stadiums and other installations to receive LEED (Leadership in Energy & Environmental Design) certification granted by the U.S. Green Building Council, which is recognised by more than 130 countries. Eight of the 12 World Cup stadiums followed sustainable construction guidelines, using water and energy saving technologies and recycled materials such as demolition waste. But what apparently will not be sustainable is the use of the stadium after the World Cup. There is a danger that the Arena Dunas will become a white elephant because football matches in that area do not generally draw more than 6,000 people, OAS business manager Artur Couto acknowledged to IPS. That means it would take over 3,000 matches just to pay off the construction costs.